How will these free benchmarking templates help me and my business? Whatever the size of your business, ‘How do we compare to our competitors?’ and 'What does good or excellence like?' are common questions when companies are looking to get more from their digital marketing. Great questions! But how do you know what to compare and how can you structure your review and recommendations? Who are the benchmarking templates for? 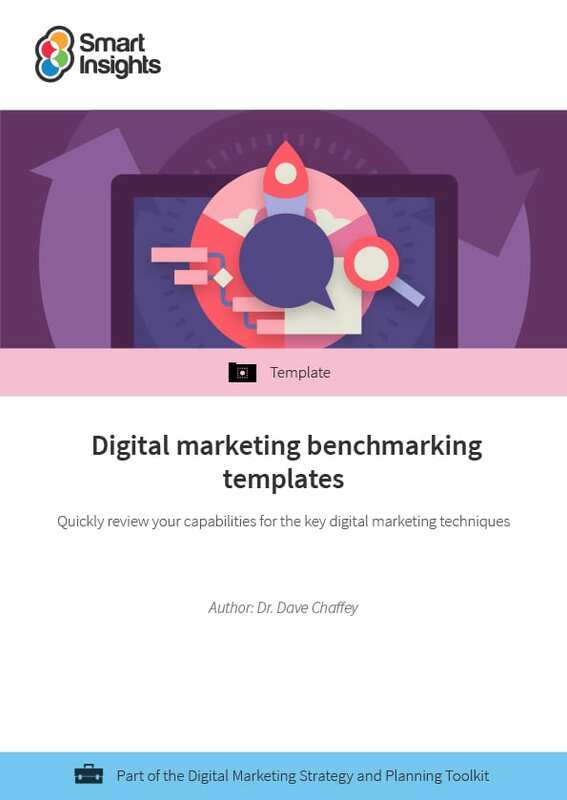 The benchmarking templates will help marketers who are responsible for managing and improving the business contribution from digital marketing as a whole, or specific channels like search or email marketing. Because each area of a business’ marketing has a dedicated benchmarking template, it is important that all stakeholders share visibility of their benchmarked performance. Channel-specific next steps should be identified that ensure all channels work under a single, unified digital marketing plan. How are the benchmarking templates structured? Our benchmarking templates use the five-point scale of the Carnegie Mellon capability maturity model, which rates different processes from an unmanaged approach as you start out at Level 1 up to a well-managed process at Level 5. Complete a comprehensive digital marketing audit by score your business (or your clients) from Level 1 to Level 5 for the different ‘best practice’ activities you are using for each of the core processes we have defined as each row. Once you know where you are currently at you can focus your efforts to improve. Use our guides to increase your skills and understanding in the key areas identified by the templates. 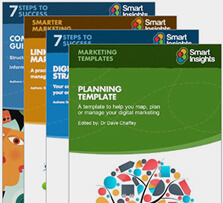 We have seven-step guides to all major areas of marketing, meaning we can help you upskill and improve your efforts whether you need help with email marketing, social media, paid media, SEO – you name it! Authors: Created by Dave Chaffey and reviewed by sector specialists. Format: 12-page downloadable PDF with capability reviews for most of the main areas of digital marketing. 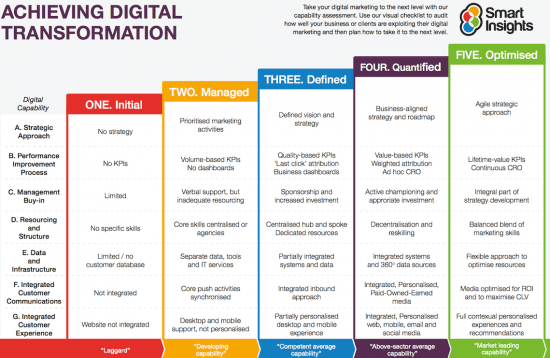 Digital marketing audit – After you’ve reviewed the benchmarking templates, this Excel spreadsheet will help you complete a more detailed review of your digital communications and experiences. It’s structured using the 25 key activities of the Smart Insights RACE planning framework. Essential marketing models – These templates have been created from the Carnegie Mellon capability maturity model, but there are several other marketing models that you may find instructive once you’ve decided on your areas of improvement. Our free guide breaks down each concept so you can understand and apply them to areas of your company including business growth, communications planning, and new product development. Dave is co-CEO and co-founder of Smart Insights. He is editor of the 100 templates, ebooks and courses in the digital marketing resource library created by our team of 25+ Digital Marketing experts. Our resources used by our Business members in more than 80 countries to Map, Plan and Manage their digital marketing.